Hi everyone! I have a midterm today and did not have a chance to write a full post, so instead you get The Adventures of Zelda Weinberg-Rosenberg in Ari’s Bathroom! You’re welcome, America. Oh, don't mind me. 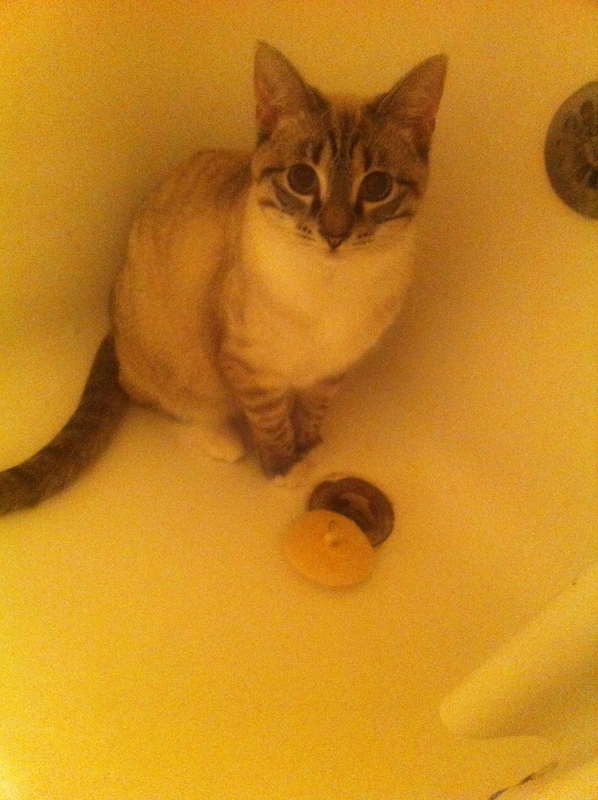 I'm just going to stare at you while you bathe. Oh, I'm sorry, you weren't going to use this, were you? Zelda scales the perilous heights of the mighty Mount Sink. Your worldview is so limited. You see a bathtub plug, I SEE A HOCKEY PUCK. Zelda's Mulan moment. "WHOOO IS THAT GIRL IIIII SEE, STARING STRAAAAIGHT, BACK AAAAAT MEEEEEE?" 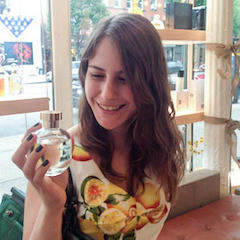 Next ›Updates and Additions to the Smell Good, Do Good Perfume Sale! I’ll admit, I could follow your blog just to have a look at Zelda’s pictures… How adorable. And I must admit in turn that this blog is merely an excuse to have somewhere to post my kitteh pictures!! She has brought so much joy and mischief into my life! Aaaawwwwww! 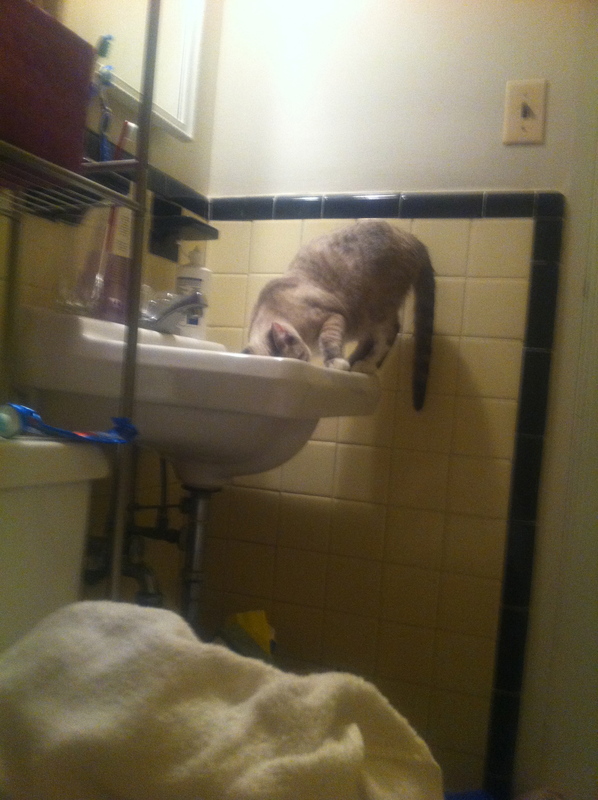 Does Zelda like you to turn on the faucet in the sink so she can have a drink? My cat does that all the time. Can’t figure out why, as there are bowls of water all over the place that he can drink from. She is so beautiful… My cat does that! When she is thirsty she waits outside the bathroom for someone passing by. 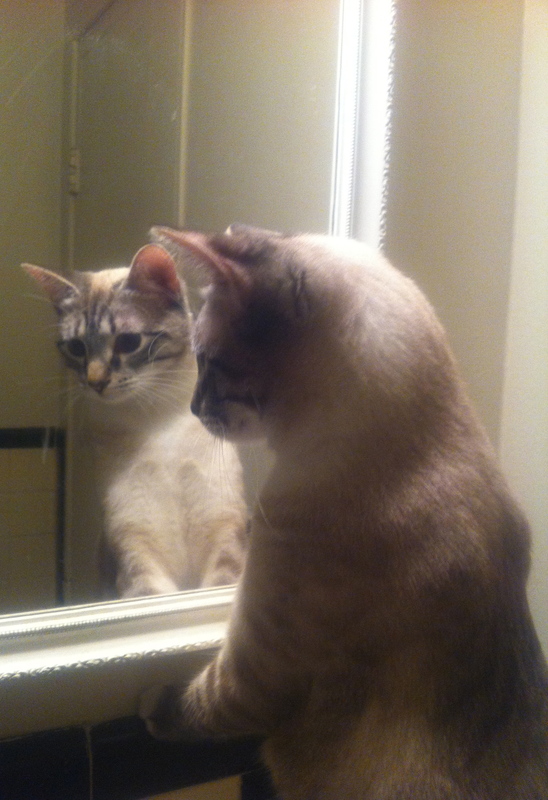 Then she meows to attract attention and jumps on the sink waiting to run the faucet. I have not taught her to do this. She just prefers running water to bowls of water just sitting there. So clever! 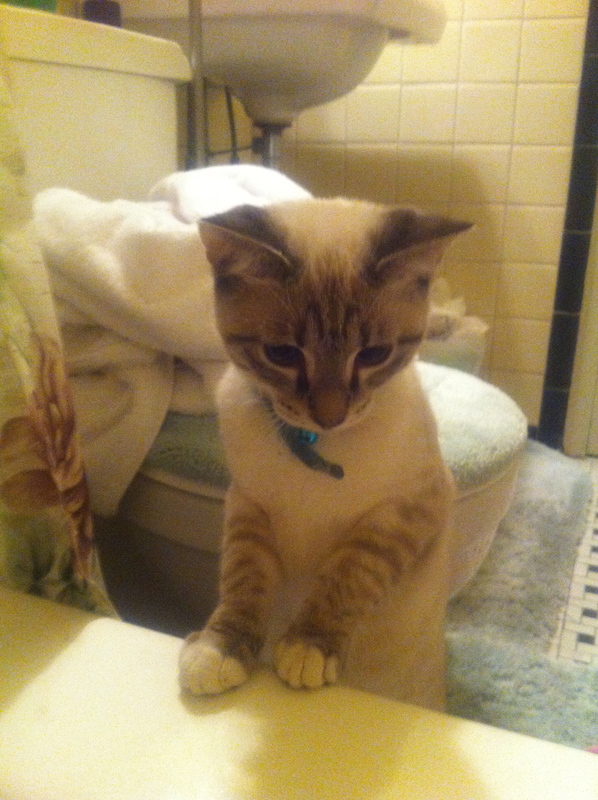 I have read about many cats who like to be “waited on” when it comes to food or water. If the bathroom door is closed (i.e., I am using the “facilities”), Mory the cat will just bonk the door open with his head. He must have one solid noggin! Aw! Zelda’s such a pretty kitty! How old is she now? Thnx for the pics. Let’s see, she was 2 months when I adopted her in August, which makes her… 9 months! But she seems to already be full grown, as evidenced by the fact that she is already 9 pounds! My chubbeh kitteh! Hope your mid-term goes well. You have a great study pal in Zelda, I’m sure. She looks as if she has ALL the answers (but won’t share them unless there’s quid pro quo!). Thank you, Joanne! I think that the midterm went pretty well, no thanks to my study pal. Thank you, Dionne! 😀 Her cuteness is her saving grace. It distracts me from her biting. She is such a pretty cat! 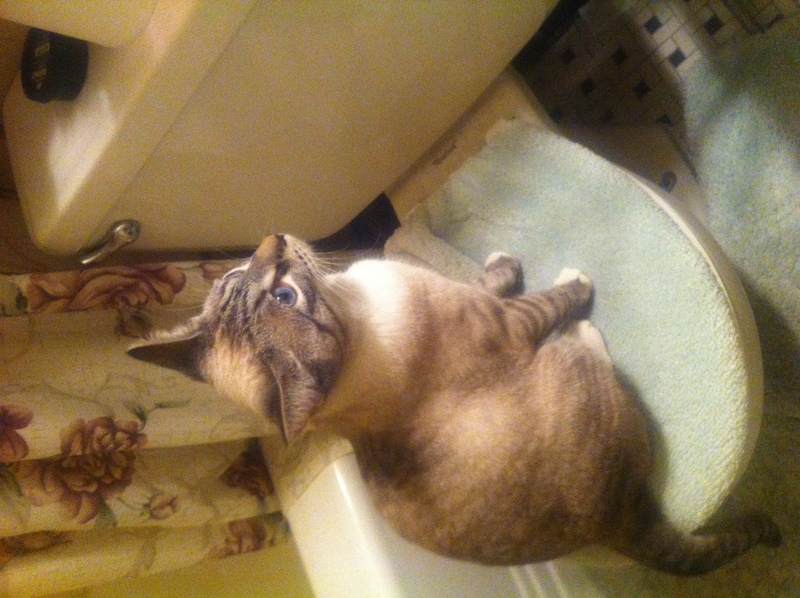 I love that she’s queen of your bathroom. My cats remember the one time I gave them a bath, and the claws come out when they so much as see the bathroom door.